In an effort not to hijack Kellyintx thread, I wanted to comment about animals bonding. Nora made a great observation. I have three Percheron draft horses. I use them in a three abreast hitch quite often. The biggest reason is that I hate to hear the pitiful whinnies from the horse left in the barn. My horses are very much bonded to each other, but for me it goes beyond that. I think they are bonded to me as well. At the very least, there is a mutual respect, built upon trust, that works both ways. I respect and trust them and they in turn, give me the same courtesy. Most of us here on the porch understand what I am talking about. It is one of the reasons that I work draft horses. I ask and they do. There is no yelling, stomping screaming fits from either side. It is pure harmony. The relationship that I have with my horses balances my life. This is especially true with mules.You want a willing partner, not a slave. Treat horses like you have to treat mules and you will be a lot further ahead. Horse or mule, when you get a new one home,you can work it and get the job done, assuming it is well trained. However, if treated right, you will see a marked difference in it's performance after 6 months or a year. I don't know what you call it but it makes things work so much easier for all involved when it all comes together. Either they got you trained to there way of working (thinking) you finally got them trained to your way of working (thinking). Some times when I am doing something and it is not working, I just stop and set or walk around talk to the animals, rub them, check the harness, relax then go back and finish the job it seems to work better for all of us involved. I don't know why it helps but it does (mabie I'm in to much of a hurry). Do I just need to slow down and enjoy the day? Very well said, Ralph! And it is not only a bonding with draft horses. I feel I have a mutual understanding and relationship with every one of my critters, be they horse, pony, donkey or cow. The only ones I doubt I have built a very lasting relationship with are the chickens. But they do greet me every time I approach, looking for a handout of kitchen scraps, of course. And over the years I have had only happiness with the roosters while friends and neighbors complain that they won't ever have a rooster again because they attack them. One reaps what one sows. If we attend to the critters with peace and quiet and have a real liking for them, they respond in kind. K.C.Fox, that is very well said. They will help us help ourselves. Vince, I have very limited knowledge of mules. My dad was a mule man. He sang their praises. I have talked to a few Amish men who work mules. All of them echo your wisdom. Vince is spot on. In his 1867 book "The Mule, a Treatise on the Breeding, Training, and Uses" Harvey Riley wrote, "There is no more useful or willing animal than the Mule. And perhaps there is no other animal so much abused, or so little cared for. Popular opinion of his nature has not been favorable; and he has had to plod and work through life against the prejudices of the ignorant. Still, he has been the great friend of man, in war and in peace serving him well and faithfully. If he could tell man what he most needed it would be kind treatment." He goes on to add, "humanity as well as economy will be best served by kindness." I've mentioned a few times that I keep a mule that is about 30 even though he doesn't have much use on the farm. I keep him because of the way he bonded to me. I had never seen anything like it. I bought the old mule because I felt sorry for him. He was eat up with worms and had a halter on that was way too small. It had cut into his head behind the ears and under his chin so bad I had to cut it out with a pocket knife. That mule stood still as a mouse for me to cut that halter loose and I know it had to hurt. I then went into the house to get some salve to put on the wound. My neighbor stood outside and had watched what I was doing. He said that mule throwed a fit as soon as I shut the door. I could see where he had pawed and walked circles around the tree until I got back. I packed the cuts with salve, the I sheared his mane, ears, and tail, and wormed him. (he didn't care much for the worming!). But after that, I can walk through the pasture and no matter where that mule is,he come to me and follow me. When I open the door to go out first thing in the morning, that mule will holler at me. If I leave the farm and come home, as soon as my truck door opens, that mule will holler at me. He is pretty good as a riding mule, and I have sorted cattle with him. He will not drive though. I can hitch him and he will not move when I call on him even though he knows gee from haw, but if I walk beside him or in front, with or with out a line, he will follow and take what ever he's hitched to. My cousin came to visit once and brought her autistic son. The son wanted to see the horses, since he was in riding therapy. We took him down to the pasture and I stood with him to keep the horses from hurting him. He had gotten a little overly excited and the horses were spooking a bit, bucking and kicking. That old mule came up to us and nuzzled that boy, and from then on stayed between him and the horses and wouldn't let them around the boy. So, I've kept this old mule, mainly as a pet and a yard ornament because of all that. And that is why folks prefer mules to horses and their popularity is growing every day. Bonding goes between human and animal , but also between animal and animal, as several here have observed. And that gets us to a difficult question: What happens when we sell animals that have bonded to each other or /and to their human caregiver ? Now I was lucky enough in my life to only rarely have to sell horses as foals, and only one time an adult horse, and it still troubles me what may have happened to them afterwards. 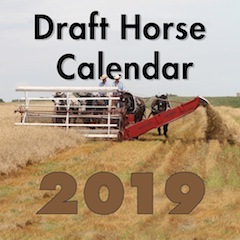 One draft colt back in Bavaria got overworked as a logging horse because he inherited his mother's willingness and died at the age of six in his traces as I later found out. As Nora observed there is bonding in cattle families. Our goats still sleep in little groups of three, mother and two siblings, after four years. Now , for economic reasons separating animals is inevitable most of the time, but we should try to handle that as kindly and with as little trauma as possible. And that is why I am totally against an agricultural system that treats animals as mere commodities, transports them around the country as if they were lifeless objects without emotions, and finally subjects them to the cruelties of feed-lots and huge slaughter houses with the relentlessness of timed conveyor-belts. As much as we can we should opt out of that system and see to it that at least we get localized processing. I want to add that in 1977 I also sold a team of Haflingers but that was easier to do because they stayed together . I think horses bond with their owners , but also with the place , and so if they have to be sold, it will be easier on them if they keep their mate. Maybe all this is easier for horses which travel a lot, like show horses, but I do not really know. But I know for sure, that we shouldn't treat sentient creatures like they are pieces of furniture. Nora..you may be right, but us folks who are nice have to keep on showing the rest of the world how it's done! Vince I wish you were closer. As I said, my dad was a mule man. He like you, loved them. I'd like to sit and listen to you talk about them.